The Nutcracker Ballet is one of the most enduring of all American holiday traditions. Never mind that the original story was written by a German, that the music was composed by a Russian or the choreography was created by a French choreographer and his Russian assistant. Nor that a Russian ballet master introduced the mostly forgotten ballet to audiences in the 1950s. George Balanchine’s version of The Nutcracker for New York City Ballet, which the company continues to present to this day, has been an American holiday tradition since 1954. 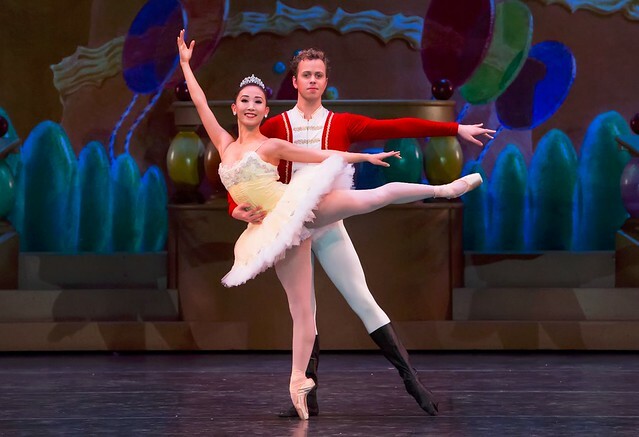 “When done right, it’s magic,” said John Varineau, Associate Conductor of the Grand Rapids Symphony, who has conducted the Grand Rapids Ballet’s annual production of the holiday favorite for many years. Grand Rapids Ballet’s 2016 production of The Nutcracker opened Friday, Dec. 9 for a total of eight performances. Shows continue through Sunday Dec. 18 in DeVos Performance Hall. Notably, the creator we most associate The Nutcracker with today isn’t Marius Petipa, ballet master of the St. Petersburg Imperial Theater, or his assistant, Lev Ivanov, who likely choreographed most of the work. It’s the composer, Peter Ilyich Tchaikovsky. Without the music, the story of Clara, her mysterious uncle Drosselmeyer, a magical Nutcracker Doll and a journey to the Land of Sweets, would just be a story. The music is an integral part of the show, and the Grand Rapids Symphony has been a part of Grand Rapids Ballet’s annual productions since the 1980s. “Many ballets use recorded music for ‘The Nutcracker’ because, quite frankly, live orchestras are expensive, especially if you are doing multiple performances,” Varineau said. “And live orchestras are fickle. It's impossible to do things exactly the same way every night. But having live music plus a conductor leading the entire performance has its advantages as well. The Nutcracker from Grand Rapids Ballet on Vimeo. Two years ago, Grand Rapids Ballet unveiled a brand-new production of The Nutcracker, co-designed by illustrator and Grand Rapids native Chris Van Allsburg, author of The Polar Express, together with Eugene Lee, a Tony Award-winning set designer based in New York, who has designed for such shows as Wicked. It’s choreographed by Val Caniparoli, longtime choreographer for San Francisco Ballet, with costumes designed by Grand Rapids Ballet artistic director Patricia Barker. Several shows sold out completely during its 2014 premiere. Between 16,000 and 17,000 people saw the new show in one of eight public performances in 2,300-seat DeVos Performance Hall. Another 1,100 to 1,200 people at the company's private gala, and another 4,000 school kids attended two daytime shows. Altogether, some 21,000 saw the debut of Grand Rapids Ballet's first, new production of The Nutcracker in three decades. “We're ecstatic,” GRB Executive Director Glenn Del Vecchio said to MLive in 2014. "Everything was better than we hoped for." "Everyone pitched in to make it come together,” he said. Now The Nutcracker is back for its third season starring, among others, Grand Rapids natives Nicholas Schultz and Laura McQueen Schultz, husband and wife. Shows continue this week at 7:30 p.m. Friday and Saturday, December 16-17 with matinees at 2 p.m. Saturday and Sunday, December 17-18, in DeVos Performance Hall.